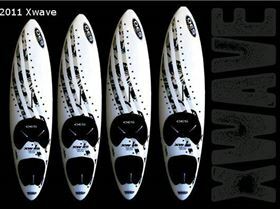 The 2011 range of single fin Xwave boards are designed for faster speed and control compaired to our existing multi wave boards range. The planshape has been shortend to add more turning and jibing ease and the tail rocker has been flattened for earlier planning and greater top end speed.We have also lowered the rail height and increased the rail tuck to be the same as our Wave Pro models for greater control at speed and to limit the front rail from catching. We have also kept the volume the same with a shorter planshape by hiding the volume in the center of the board and increasing the nose widths to stop the board from perling /nose diving on the back of waves and looping with the shorter board lenghts. We have also used the same bottom shape as our Wave Pro boards with a flat area in the nose to a progressive vee bottom and double tail concave. The double tail concave gives the board three different tail rocker for a faster water release and deepens the vee in the centre of the board under your back foot for easier rail to rail transitions. The construction is not compromised as it is the same as all our wave boards, with our 3 different constructions to better suit your price range and sailing needs with our CIC, CKC and CGC construction so the boards can be ridden and looped hard.